Today we are going to take an in depth look into Paint Your Life (paintyourlife.com). An online service that allows you to submit your photographs online and have a dedicated oil painting created by artists, framed and sent to you by mail. On the surface, this sounds like a wonderful service. As the name of the company so aptly puts, you can send pictures of precious life memories and have them celebrated in the form of a wonderful painting. Thousands of customers have used the service over the last 13 years. What has been their experiences? How much does it all cost and do the finished results live up to expectations? In true Vault50 form we have investigated to give you the comprehensive low down. For all that information and more keep on reading. If you are in a rush, check out the summary below. Paint your life is an excellent way of turning precious memories into quality artwork. With a wide choice of mediums, artists and canvas size you really can customize the finished result with ease. Furthermore, you don’t pay until you are completely satisfied and unlimited revisions are included. Prices are a bit on the expensive side, (you could probably source a local artist for cheaper), however, the service is very difficult to fault overall. Paint Your Life is an specialized art platform that was founded by Assaf Kostiner in 2006 as a collective of painters in a studio that focused on handmade oil paintings. It developed with professional input and reorganization into what it is today – an adaptive team of painters under a transformative leadership that values openness, creative thinking, open-mindedness, and participative stewardship during decision-making. The company has a showroom in North Miami Beach in Florida where people can view their art pieces, and also interact with company representatives, as well as place orders for their art. What do they do at Paint Your Life? Currently, its main focus is on creating handmade paintings from photos. These paintings not only preserve and add artistic value to memorable events, but they can also be used as home décor, gifts, or exhibits in an art gallery. 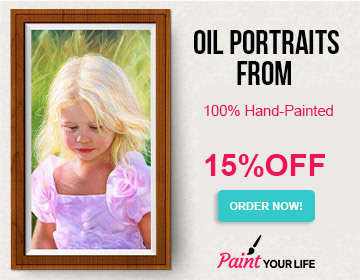 Evidently, this company specializes in using photos to create customized hand-painted portraits. These portraits can be oil paintings, watercolor, acrylic, charcoal, pastel, and pencil art. To ensure that the customer receives the right painting, there is an option of an online proof which displays the painting, and allows the client to see what (s)he will receive, and if necessary, request for corrections and edits. Furthermore, there is a multi-tiered, peer-based quality control process that ensures that a painting is reviewed and appraised by other painters in order to certify that it matches the level of professionalism expected by the company and its clients. Moreover, to simplify the delivery process, the paintings are shipped free of charge, which also helps to reduce the turnaround time (the duration from request to acquisition of painting). An added benefit is that the paintings are framed before shipping. Professionalism demands that its painters be acquainted with several art philosophies, as well as be experienced in using more than one philosophy in their careers. This builds the knowledge-base and skillset of the (painter) workforce of PaintYourLife, and has enabled it to serve over 30,000 clients, as well as gain a fitting reputation as a reliable and professional company dedicated to providing exceptional value and high-quality service to its clients. Furthermore, professional experience allows this company to offer art consultation services and graphic design services. In fact, another brand associated with PaintYourLife.com is PopArta which focuses on graphic design and manual editing of paintings. Usually, the photograph sent by the client is developed into a format – mainly a photographic slide – that can be projected onto the canvas, or transferred using traditional-grid techniques onto the painting surface. This projection or transfer ensures that the painting is a direct copy of the photograph, though with considerable size-scaling. It also allows for geometric rigor of photographed objects, and reflections seen on specular surfaces to be preserved and observed in the final art piece. PaintYourLife.com provides a straight-forward and easy-to-use request processing portal – called Easy 1-2-3 Wizard – for processing client requests, and providing each client with unique login credentials that are to be used during follow-up or when requesting for revisions. Also, this portal is linked to email forwarding service which ensures that the client is constantly appraised of the progress through email updates. Most importantly, this portal allows the client to upload the photo to be used as the subject of the painting. This photo must be a high-quality photo that provides all the required details. Alternatively, one can upload several photos with instructions of how the final art should appear. Before uploading the photo, one must first choose the size of the painting, as this also determines the frame size and cost. The sizes range from the standard portrait size of 8inches by 10inches (8” X 10”), through large portrait size of 20” X 24” to the large artwork size of 48” X 72”. When sizing the painting, one needs to consider where it is going to be placed in the house or gallery. This ensures that the size is matched to its placement, for instance, the standard portrait size is fit for nightstand or mantle-mounting, while large artworks are best suited for wall-mounting. Next, one selects the portrait medium, that is, which paint, watercolor, pastel, or pencil (colored or black) is to be used. The portrait medium influences the price and framing option. After that, the photograph is uploaded. One then chooses the painter to work with. You can do this using the extensive gallery on the PaintYourLife.com website to see the artists’ previous work. This gives you a flavor of their competence level and artistic sensibility. It also gives you an idea of the medium they are comfortable with. Choosing a painter offers several advantages, such selection of artistic taste, uniqueness of art, and the option of asking the painter to edit the image so as to remove elements present in the photograph which one does not want to see in the artwork, as well as add elements into the artwork. This allows one to change the background, foreground, and scenery so as to achieve a unique image. The online proof option allows one to see how the painting looks like, and request necessary edits. Expectedly, this ensures that one receives the desired painting. If the painting is not up-to expectations, revisions can be requested. PaintYourLife also allows the client to choose which paint to use. The main paint pigments available are oil paint, acrylic paint, charcoal pigments in paint, and watercolor paint where the paint pigment is contained in a water-based solution. Pastel paintings and pencil arts are also available. The use of the aforementioned paints and painting techniques allow the company to create unique paintings which can be categorized based on the subject matter into; pet, outdoor, and wedding paintings; as well as family, couple, child, and baby portraits. There are currently 29 styles of frame that you can select for the framing of your painting once it is completed. All frames are made from solid wood and are well packaged for delivery to avoid any issues witth damage during transit. Prices are good ranging from 30 to 50 dollars and this additional cost is transparently added during the ordering stage so that you receive no surprises on the finished bill. All sizes are catered for in line with dimensions of the painting that you choose. Customer experience is key to building the consumer base, and as thus, PaintYourLife.com has invested heavily on providing superb customer service that not only ensures that the client gets value for his cash, but also ensures that the client is satisfied with the aesthetics, art style, and physical condition (that is, there is no breakage or abrasion) of the painting. There is also a money-back guarantee with no unnecessary, inappropriate, or stalling questions asked. This company is committed to providing high-quality paintings, excellent service delivery, and fair pricing so as to ensure that their products are affordable. Besides offering optimal customization and uniqueness in their art. The prices and estimated turn-around time are provided under the pricing & timing menu tab in the website. Another aspect of customer experience is how the customers interact with the company website. Its website features a customized user interface that is designed to allow for easy navigation through the navigation bars and hyperlinked thumbnails, which in turn optimizes user experience by allowing the client to find specific data (or data sets such as gallery and pricing), as well as relaxed scanning of sampled paintings and art projects. As mentioned earlier, PaintYourLife provides a platform that link clients to professional painters, and it is therefore imperative that it showcases the paintwork of the different painters. It does this in its galleries – the brick-and-mortar gallery in North Miami Beach, and the online gallery. The online gallery features professional paintings done by different painters, with each painting captioned by the name of the painter, with an additional hyperlinked option that allows one to select that painter to work on his/her project. Moreover, some clients allow their paintings to be showcased on this online gallery so that one can see the varied artistic tastes of different clients. Relatedly, it is by reviewing this gallery that one can appreciate the level of photorealism captured in the paintings, with more refined and detailed paintings closely approximating hyperrealism. Furthermore, there are pencil art which shows that the painters are flexible and adaptable to client needs, and can adequately match the artistic needs of their clients to different graphic art forms. Relatedly, this allows art enthusiasts and geeks to provide instructions for painters to blend different art philosophies into a single painting. There is also need to mention an issue that some clients experience when using the chat service provided in the website. If the client decides to chat directly with the painter, then it is imperative that (s)he keeps in mind that some painters come from a non-English-speaking background, and this can create communication difficulties, especially if the client uses American lingo when chatting with the painter. PaintYourLife is a company dedicated to creating hand-made art – mainly paintings and portraits – from photographs. Its high-quality paintings preserve and add artistic value to memorable events, and they can also be used as home décor, gifts, or exhibits in an art gallery. Regarding business practices, it is committed to providing high-quality paintings, exceptional service delivery, and fair pricing so as to ensure that their products are affordable; besides offering optimal customization in their art. Also, to ensure that the customer receives the right painting, there is an option of an online proof. Furthermore, there is a multi-tiered, peer-based quality control process that ensures that a painting is reviewed and appraised by other painters in order to certify that it matches the level of professionalism expected by the company and its clients. Additionally, to simplify the delivery process, the framed paintings are shipped free of charge. This is complemented by a transparent refund policy. The main paint pigments used are oil, acrylic, and charcoal. Watercolor paints and pastel are also available, along with pencil art. Its Easy 1-2-3 Wizard request processing portal allows for straight-forward and transparent processing of client requests, as well as providing each client with unique login credentials that are to be used during follow-up or when requesting for revisions. Overall the service is an excellent, fool-proof way of imortalizing wonderful memories in the form of quality pieces of artwork.